So this particular brain child was born of the post-holiday depression that set in pretty soon after I touched down from London – the idea came to me in the wee hours of the night, while surfing mindlessly through the web trying to battle jetlag (and failing miserably). Truly, there is no better way to get over your misery than by surrounding yourself with good company, better food, and lots of drink (from breakups to makeups to massive disappointments at work – this remedy works like a charm). If I ever had an entertaining-only blog, I think I’d call it The Lazy Contessa or HMME (hostess with the mostest at minimum effort). It wouldn’t just be entertaining made easy, it would be Entertaining for the Ultimate Lazy. This particular party idea fits right into that theme and is somewhat similar to Sundaes on Sunday from last summer. However, instead of overwhelming guests with saccharine sweetness, you’ll fill them up with savoury goodness instead. 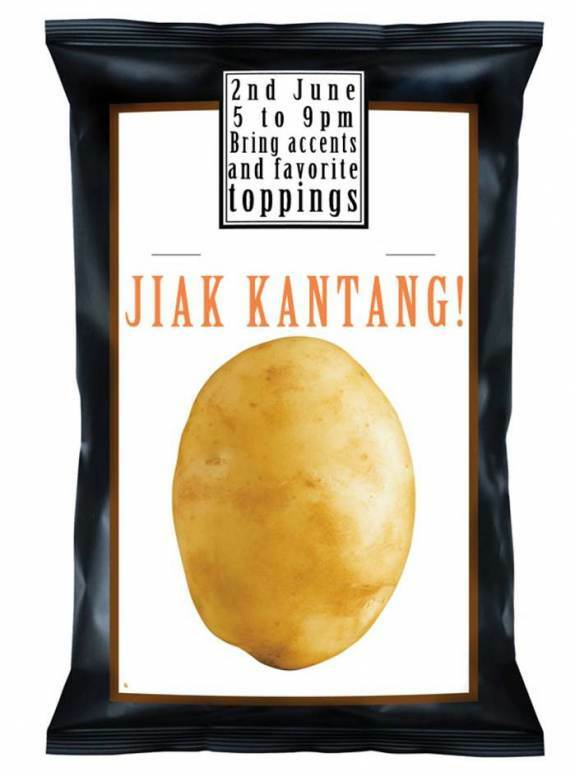 All you’ll need is lots of potato and a guest list full of creative people. Speaking of creative, let’s take a minute to appreciate the invite P crafted. Again I say, he’s a banker by day but a creative agent on the sly. So here’s what you’ll need to prepare: Baked Potatoes (dressed up in jackets to make dressing them a little easier), and some basic toppings such as cheese, bacon bits, sour cream, butter, chopped green onions and sautéed onions. What you can politely request from your guests: avocados, roast chicken (shredded), brie, cranberry sauce, smoked salmon, chili, jalapenos, more cheese (cream cheese, grated cheddar cheese, goat cheese, bleu cheese and more! ), sautéed spinach, sautéed mushrooms, tuna-mayo, olives, peppers, cocktail onions, and if they’re feeling really generous, how about some caviar! I got lucky in that some of my guests went overboard – which I am ever so grateful for. D made her PSOC (potato salad on crack), a crowd favourite that’s well loved by all and known to have people creeping into the kitchen in the wee hours of the night to wipe out the leftovers. And L brought an entire pot of chicken curry (pure genius since we had all the potatoes to pile into it). And because potato does not make for good dessert, we threw together a thoroughly refreshing fruit salad made of fresh basil, sprigs of mint, watermelon and cantaloupe. A mini melon scooper makes this dish fun: scoop out bite-sized pieces of cantaloupe and watermelon, chill them in the fridge till they’re refreshing (what does this mean? Long enough to get cold, not so long that they freeze), and toss together with some balsamic vinegar, EVOO, and the leaves (basil and mint, minus the stems. Stems aren’t fun to eat). It was super summery and just the right note to end the meal on. Don’t forget to layout the seasoning as well – I like having some coarse ground black pepper and Tetsuya’s truffle salt in little dishes. With that, you’re ready to roll! On a last note before I go, anyone got some super sensational summer party ideas for me? I’d do the Fourth again, but TBC seems to have that covered, and I just missed the Swedish Midsummer Solstice. Maybe I’ll go back to my mountain man/ maple wood roots and celebrate Canada Day.